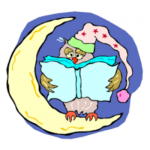 Join us at the library in your cozy pajamas! Grab a stuffed animal friend, and come hear pajama stories and make crafts with us. Our favorite day of the year, because we get to wear our pajamas to work!